Objectives To prospectively evaluate the joint association of duration of rotating night shift work and lifestyle factors with risk of type 2 diabetes risk, and to quantitatively decompose this joint association to rotating night shift work only, to lifestyle only, and to their interaction. Setting Nurses’ Health Study (1988-2012) and Nurses’ Health Study II (1991-2013). Participants 143 410 women without type 2 diabetes, cardiovascular disease, or cancer at baseline. Exposures Rotating night shift work was defined as at least three night shifts per month in addition to day and evening shifts in that month. Unhealthy lifestyles included current smoking, physical activity levels below 30 minutes per day at moderate to vigorous intensity, diet in the bottom three fifths of the Alternate Healthy Eating Index score, and body mass index of 25 or above. Main outcome measures Incident cases of type 2 diabetes were identified through self report and validated by a supplementary questionnaire. Results During 22-24 years of follow-up, 10 915 cases of incident type 2 diabetes occurred. The multivariable adjusted hazard ratios for type 2 diabetes were 1.31 (95% confidence interval 1.19 to 1.44) per five year increment of duration of rotating night shift work and 2.30 (1.88 to 2.83) per unhealthy lifestyle factor (ever smoking, low diet quality, low physical activity, and overweight or obesity). For the joint association of per five year increment rotating night shift work and per unhealthy lifestyle factor with type 2 diabetes, the hazard ratio was 2.83 (2.15 to 3.73) with a significant additive interaction (P for interaction <0.001). The proportions of the joint association were 17.1% (14.0% to 20.8%) for rotating night shift work alone, 71.2% (66.9% to 75.8%) for unhealthy lifestyle alone, and 11.3% (7.3% to 17.3%) for their additive interaction. Conclusions Among female nurses, both rotating night shift work and unhealthy lifestyle were associated with a higher risk of type 2 diabetes. The excess risk of rotating night shift work combined with unhealthy lifestyle was higher than the addition of risk associated with each individual factor. These findings suggest that most cases of type 2 diabetes could be prevented by adhering to a healthy lifestyle, and the benefits could be greater in rotating night shift workers. Therefore, we analyzed data for participants in two large prospective cohorts to test the hypothesis that rotating night shift work and unhealthy lifestyle factors were jointly associated with risk of type 2 diabetes. We then quantitatively calculated the proportions of this joint association for rotating night shift work, unhealthy lifestyle factors, and their interaction. We used data from the Nurses’ Health Study (NHS) and NHS II. The NHS began in 1976 when 121 701 female registered US nurses, aged 30 to 55 years, responded to a baseline questionnaire. The NHS II started in 1989 and included 116 677 female registered US nurses, aged 25 to 42 years. In the NHS and NHS II, baseline and follow-up questionnaires were sent to participants every two years to update medical and lifestyle information over the follow-up period. Participants completed an initial food frequency questionnaire in 1980 for NHS and 1991 for NHS II. Food frequency questionnaires were updated approximately every four years thereafter. The follow-up rates exceeded 90% in both cohorts. We used 1988 as baseline for the NHS and 1991 for NHS II, when information on both rotating night shift work and all lifestyle factors was first ascertained. At baseline, we excluded participants with a self report of diabetes, coronary heart disease, stroke, or cancer, as the diagnosis of these diseases could potentially lead to changes in their lifestyle or the shift work routine. We further excluded participants with missing data on shift work and important covariates including age, diet, physical activity, smoking status, or body weight. The final analysis included 55 324 participants from the NHS and 88 086 participants from the NHS II. The details of the exclusions are shown in supplementary figure A. In 1988 the NHS participants were asked the following question: “What is the total number of years during which you worked rotating night shifts (at least three nights per month in addition to days/evenings in that month)?”, with eight pre-specified response categories (never, 1-2, 3-5, 6-9, 10-14, 15-19, 20-29, and ≥30 years). In 1989 the NHS II participants were asked the same question with seven pre-specified response categories (never, 1-2, 3-5, 6-9, 10-14, 15-19, and ≥20 years). We updated this information in 1991, 1993, 1997, 2001, 2005, 2007, and 2009 in NHS II. In 1991, 1993, 1997, 2007, and 2009 we collected information on the total number of months during which the nurse had worked rotating night shifts in the previous two years, with pre-specified response categories (none, 1-4, 5-9, 10-14, 15-19, and ≥20 months). Additionally, in 2001 we asked about duration of rotating night shifts in 1993-95, 1995-97, 1997-99, and 1999-2001. In 2005 we collected data on the duration of rotating night shifts in 2001-03 and 2003-05. We assigned and added together midpoint values in years and calculated the cumulative years of rotating night shifts for the NHS II women. The analyses reported here used baseline assessments of lifetime shift work history in the NHS and cumulative shift work exposure through 2009 in the NHS II. We defined low risk lifestyle factors as normal weight (body mass index ≥18.5 and <25), not smoking, physical activity levels of at least 30 minutes a day at moderate to vigorous intensity, and AHEI score in the upper two fifths.25 For each unhealthy lifestyle factor, participants received a score of 0 if they met the criterion for low risk or 1 otherwise. Information on potential confounders was assessed and updated every other year via the questionnaires throughout follow-up. This information included age, marital status, living status, use of aspirin, use of multivitamins, menopausal status and postmenopausal hormone use, oral contraceptive use, prevalent hypertension and hyperlipidemia, and drug treatment for high blood pressure and high lipid concentrations. Alcohol use was assessed and updated every four years from the food frequency questionnaires. We age standardized the participants’ baseline characteristics except age, according to duration of rotating night shift work, to allow populations to be compared. Participants contributed person time from the return of the baseline questionnaire (NHS, 1988; NHS II, 1991) until the date of diagnosis of type 2 diabetes, death, loss to follow-up, or the end of the follow-up period (30 June 2012 for the NHS and 30 June 2013 for NHS II), whichever came first. We used multivariable time dependent Cox proportional hazards models to estimate hazard ratios and 95% confidence intervals for the associations between shift work alone and in combination with unhealthy lifestyle factors and incident type 2 diabetes. We used the two year follow-up intervals to construct the time intervals. If a participant quit rotating night shift work, we used the cumulative shift work duration in the last interval. For the association between duration of rotating night shift work and risk of type 2 diabetes, we selected participants without a history of rotating night shift work as the reference group. A linear trend was quantified across rotating night shift work duration categories by assigning the median value to each category and modeling this variable as a continuous variable. In multivariable analysis, we adjusted for several confounding factors including ethnicity, family history of diabetes, living alone or with others, marital status, menopausal status and postmenopausal hormone therapy use, oral contraceptive use (NHS II only), smoking status, alcohol consumption, physical activity, and the AHEI. In a subsequent model, we additionally adjusted for body mass index. We examined the associations of the overall unhealthy lifestyle score and the individual lifestyle factors with risk of type 2 diabetes by adjusting for the covariates listed above. Each individual lifestyle factor was mutually adjusted for each other. We then classified participants according to the joint categories of rotating night shift work duration and the number of unhealthy lifestyle factors. We used updated levels of lifestyle factors to calculate the unhealthy lifestyle score from the most recent questionnaire. Using multiplicative and additive interaction analyses, we evaluated whether the associations between rotating night shift work duration and type 2 diabetes differed by number of unhealthy lifestyle factors.2930 We tested for the presence of multiplicative interaction by including a cross-product term between rotating night shift work duration and unhealthy lifestyle score in our fully adjusted multivariable model. We then compared the −2 log likelihood values in models with and without the cross-product interaction term. 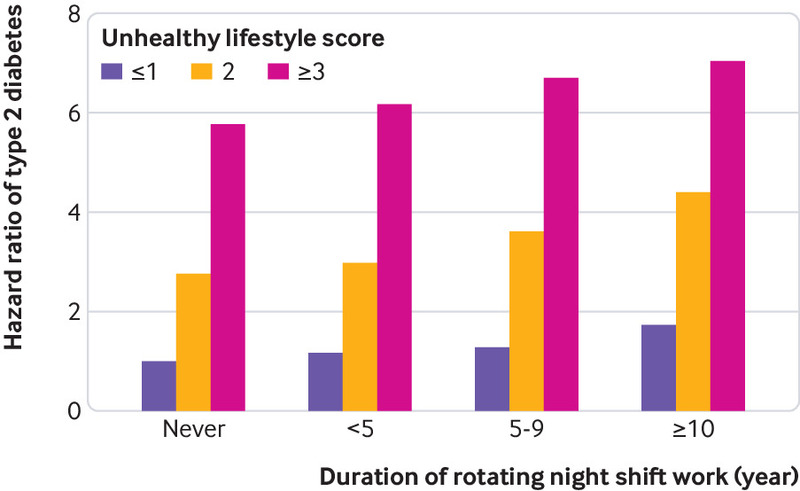 To assess additive interaction between rotating night shift work duration and unhealthy lifestyle on risk of type 2 diabetes, we considered duration of rotating night shift work and the number of unhealthy lifestyle factors as two continuous variables. The relative excess risk due to interaction was assessed as an index of additive interaction.31 We also examined the decomposition of the joint effect: the proportion attributable to rotating night shift work alone, to unhealthy lifestyle alone, and to the interaction.31 Briefly, on the hazard ratio scale, we decomposed the joint excess relative risk for both exposures (HR11−1) into the excess relative risk for shift work alone (HR01−1), unhealthy lifestyle alone (HR10−1), and relative excess risk due to interaction (RERI). Specifically, we have HR11−1=(HR01−1)+(HR10−1)+RERI. We then likewise calculated the proportion of the joint effect due to shift work alone (HR01−1)/(HR11−1); due to unhealthy lifestyle alone (HR10−1)/(HR11−1); and due to their additive interaction, RERI/(HR11−1). Owing to differences in age, follow-up time, and the questionnaires in the two cohorts, we did all analyses separately in each cohort to achieve better control of confounding. We pooled the hazard ratios from the multivariable adjusted models in each cohort to obtain a summarized risk estimate by using an inverse variance weighted, random effect meta-analysis. We used the Cochrane Q statistic and the I2 statistic to examine the heterogeneity of associations between the cohorts. We did several sensitivity analyses to test the robustness of our results. Firstly, we additionally adjusted for prevalent hypertension and hyperlipidemia and for drug treatment for high blood pressure and high lipid concentrations. Secondly, we did analyses to assess the joint association of duration of rotating night shift work and unhealthy lifestyle with risk of symptomatic type 2 diabetes, defined as participants who reported at least one symptom of diabetes. Thirdly, to test whether our results were biased by stopping updating selectively, we used baseline levels of lifestyle factors to calculate the unhealthy lifestyle score. Fourthly, because body mass index had a strong and positive association with risk of type 2 diabetes, we removed it from our lifestyle factors score. Fifthly, we created a weighted unhealthy lifestyle score in which each unhealthy lifestyle factor was weighted on the basis of the multivariable regression coefficient of its association with type 2 diabetes. Finally, we used fixed effects, rather than random effects, models. We used SAS 9.3 for UNIX for all analyses and set statistical significance at a two tailed P value below 0.05. Table 1 shows age and the age adjusted characteristics of study participants at baseline according to categories of duration of rotating night shift work. In both cohorts, compared with women with no history of rotating night shift work, those with more years spent in rotating night shift work were more likely to be current smokers and to have higher body mass index. With increasing duration of rotating night shift work, the participants were older in the NHS; a greater proportion of women were unmarried and lived alone in the NHS II. No appreciable differences in quality of diet and amount of physical activity were apparent across durations of rotating night shift work. We documented 5474 incident cases of type 2 diabetes during 1 139 597 person years of follow-up in the NHS and 5441 cases during 1 778 721 person years of follow-up in NHS II. We observed a positive association between duration of rotating night shift work and risk of type 2 diabetes in both cohorts. Compared with women without rotating night shift work, the pooled multivariable adjusted hazard ratios for women with 1-5, 5-9, and 10 or more years of rotating night shift work were 1.11 (95% confidence interval 1.00 to 1.22), 1.28 (1.10 to 1.49), and 1.46 (1.33 to 1.62) (P for trend <0.001) (table 2). When we further adjusted for updated body mass index, the association was attenuated but remained significant for rotating night shift work duration of at least five years (hazard ratio 1.04 (1.00 to 1.09) for 1-5 years; 1.09 (1.02 to 1.17) for 5-9 years; 1.16 (1.09 to 1.24) for ≥10 years; P for trend <0.001). When we examined the association of individual lifestyle factors with risk of type 2 diabetes, current smoking and a higher body mass index were positively associated with risk of type 2 diabetes (supplementary table A). However, a higher AHEI score and a higher level of moderate to vigorous physical activity were both associated with a lower risk of type 2 diabetes (supplementary table A). When considered together, compared with participants with one or fewer unhealthy lifestyle factors, a combination of at least three unhealthy lifestyle factors was associated with more than a fivefold risk (hazard ratio 5.39, 3.65 to 7.95) for type 2 diabetes (supplementary table A). When we examined the association of joint categories of duration of rotating night shift work and the number of unhealthy lifestyle factors, within each category of rotating night shift work duration, each additional unhealthy lifestyle factor was consistently associated with a higher risk of type 2 diabetes. Across all levels of unhealthy lifestyle factors, we documented a consistent and graded increasing risk of type 2 diabetes with increasing duration of rotating night shift work. Compared with the reference group (those having no exposure to rotating night shift work and one or fewer unhealthy lifestyle factors), the multivariable adjusted hazard ratio for type 2 diabetes among women with at least 10 years of rotating night shift work duration and with at least three unhealthy lifestyle factors was 7.04 (5.29 to 9.37) (fig 1). Tests for multiplicative interactions were not significant (P>0.67). We documented a significant additive interaction between duration of rotating night shift work and number of unhealthy lifestyle factors (P<0.001). The multivariable adjusted hazard ratios for type 2 diabetes were 1.31 (1.19 to 1.44) per five year increment of rotating night shift work duration, 2.30 (1.88 to 2.83) per unhealthy lifestyle factor, and 2.83 (2.15 to 3.73) for their joint effect, with a relative excess risk due to interaction of 0.20 (0.09 to 0.48) (table 3). The attributable proportions of the joint effect were 17.1% (95% confidence interval 14.0% to 20.8%) for rotating night shift work alone, 71.2% (66.9% to 75.8%) for unhealthy lifestyle alone, and 11.3% (7.3% to 17.3%) for their interaction. The relative excess risk due to the interaction was relatively higher in the NHS II (0.32, 0.21 to 0.42) than in the NHS (0.13, 0.09 to 0.17). In sensitivity analyses, the joint associations of rotating night shift work and lifestyle risk factors with type 2 diabetes were slightly attenuated, but they remained significant after additional adjustment for prevalent hypertension, hyperlipidemia, and drug treatment for high blood pressure and high lipid concentrations (supplementary table B). When we restricted cases of type 2 diabetes to those with symptoms, results were similar to those from the main joint analysis (supplementary figure B). When we used the baseline lifestyle score in place of the updated lifestyle score, the joint association was attenuated but remained consistent with the main joint analysis (supplementary figure C). Results were similar when we use the weighted lifestyle score by assigning weights to each lifestyle factor (supplementary table C). When we removed body mass index from the unhealthy lifestyle score, the joint associations of rotating night shift work and lifestyle risk factors with type 2 diabetes were observed among the overall, body mass index below 25, and body mass index 25 or higher populations, without evidence of an additive or multiplicative interaction (supplementary figure D). When we used fixed effects instead of random effects models, results were not materially altered. In two large cohorts of US nurses, duration of rotating night shift work and unhealthy lifestyle (current smoking, a low quality of diet, low physical activity levels, and overweight or obesity) were independently and jointly associated with a higher risk of type 2 diabetes. The proportions of the joint association were 17% for duration of rotating night shift work alone, 71% for unhealthy lifestyle alone, and 11% for an additive interaction between rotating night shift work duration and unhealthy lifestyle. We observed a higher body mass index and higher smoking rates among women with rotating night shift work, in line with previous epidemiologic studies, including our studies in the NHS and NHS II cohorts.81416 However, in this study, we found no appreciable differences in quality of diet and amount of physical activity across categories of duration of rotating night shift work. The evidence for the effect of shift work on physical activity presents a mixed picture. Previous studies have reported negative, positive, or no effects on levels of physical activity in shift workers compared with day workers.141837 With respect to quality of diet, a few studies observed alterations in eating habit and specific nutrient intake among shift workers relative to day workers.171819 However, owing to limitations in study design and variability in defining shift work and assessing dietary intake, results are difficult to compare between studies. In our previous study in the NHS II, history of night shift work was not associated with quality of diet,14 but no study has investigated the overall diet quality across different shift work categories. Consistent with our previous study and another study among US black women,833 adjustment for lifestyle factors did not attenuate the association between rotating night shift work and type 2 diabetes. Previous evidence on the health effect of lifestyle factors in conjunction with shift work is sparse. In this study, we found that the highest risk for type 2 diabetes was among women with at least 10 years of rotating night shift work duration and at least three unhealthy lifestyle factors compared with women who had no history of rotating night shift work and one or fewer unhealthy lifestyle factors. Unhealthy lifestyle factors were consistently associated with higher risk of type 2 diabetes across each stratum of rotating night shift work duration, emphasizing the importance of a healthy lifestyle in preventing type 2 diabetes. This study is limited to shift work in US female nurses, and the specific shift work pattern examined is rotating night shift work. Shift work patterns can differ between professions and countries and are differentially associated with risk of type 2 diabetes.3839 The generalizability of our findings to other populations with other shift work patterns may be limited, and further studies are warranted to replicate our findings in other populations with rotating night shift work and other shift work patterns. Rotating night shift work and related unhealthy lifestyles are likely to share several possible mechanisms involved in increasing the risk of type 2 diabetes. For example, rotating night shift work alters sleep and circadian rhythms that play important roles in daily normal metabolic function, by regulating patterns of energy expenditure and hormones involved in energy metabolism such as leptin, ghrelin, thyrotropin, insulin, and melatonin.404142 Disruption of sleep and circadian rhythms could contribute to insulin resistance, impaired glucose regulation, and development of type 2 diabetes.43444546 Accumulating evidence also suggests that sleep and circadian rhythms are influenced by lifestyle behaviors such as smoking,474849 diet,5051 and physical activity.5253 Recent studies have found that circadian related genetic variants could modify the effect of dietary carbohydrate intake on cardiometabolic traits and the association of sleep duration with body mass index and macronutrient intake.5455 Additionally, given the increasing evidence underlying the role of gut microbiota and microbial metabolites in the development of type 2 diabetes,5657585960 changes in gut microbiota have been proposed as a potential pathway linking shift work and metabolic diseases because sleep loss and circadian misalignment could disrupt the intestinal microbiota.616263 Furthermore, lifestyle behaviors, especially diet and physical activity, could affect gut microbial diversity and metabolites,64656667 which may modify the association between rotating night shift work and risk of type 2 diabetes. Further studies are needed to explore the pathways underlying the interaction between rotating night shift work and lifestyle factors on risk of type 2 diabetes. The major strengths of our study include the prospective design, large sample size, repeated measures of lifestyle and body weight, and long term follow-up. To our knowledge, this is the first study to investigate how rotating night shift work and modifiable lifestyle factors are jointly related to risk of type 2 diabetes. The study also has certain limitations. Our estimates of joint effect and additive interactions were assessed on a relative scale, derived from the widely used Cox proportional hazards model. The test and measures of interactions depended neither on follow-up time nor on the covariates, but the Cox model relied on the proportional hazards assumption and could be biased, especially if confounding was present. We carefully controlled for confounding, using time varying covariates. In addition, the presence of a statistical additive interaction does not necessarily imply the presence of a causal interaction. The participants were all female nurses and mostly white, which limits the generalizability of our findings to other populations, particularly men and other racial or ethnic groups. However, the relative homogeneity of this study population in educational attainment and socioeconomic status enhances the internal validity of our findings. Because information on rotating night shift work and lifestyles was self reported, potential exists for exposure misclassification. However, all our questionnaires were validated, and the high educational status of the study participants ensures that we are obtaining quality data. Furthermore, if measurement error does exist, the prospective design of our study indicates that such bias would likely be random with respect to outcome status, resulting in attenuation of the effect estimates and thus underestimation of the true associations. Additionally, the assessments of rotating night shift work lacked information about actual night working time and work stress, both of which have been shown to be independently associated with risk of type 2 diabetes.6869 We also did not have data on permanent night shift work over time and could have included participants with such schedules in the reference group. Although the lifestyle factors were differentially associated with risk of type 2 diabetes, we assigned equal weight to each lifestyle factor in our unhealthy lifestyle score. However, our analysis based on a weighted score yielded similar results. Finally, in the NHS, we had only baseline assessment of rotating night shift work. In two large US cohorts of female nurses, both rotating night shift work and unhealthy lifestyle were associated with a higher risk of type 2 diabetes, and the joint effect was higher than the addition of the risks associated with each individual factor. Our findings suggest that most cases of type 2 diabetes could be prevented by adherence to a healthy lifestyle, and the benefits would be larger in rotating night shift workers. Further studies are warranted to confirm our findings and clarify the underlying mechanisms. Contributors: ZS, FBH, and SNB were involved in the study conception and design. ZS analyzed and interpreted the data. YL, GZ, and YG provided statistical expertise. ZS drafted the manuscript. All the authors participated in the interpretation of the results and critical revision of the manuscript. The corresponding author attests that all listed authors meet authorship criteria and that no others meeting the criteria have been omitted. ZS and SNB have full access to all of the data in the study and take responsibility for the integrity of the data and the accuracy of the data analysis; they are the guarantors. Funding: This study was supported by research grants UM1 CA186107, R01 HL034594, R01 HL088521, UM1 CA176726, UM1 CA167552, R01 OH009893, R01 HL35464, P30 DK46200, and R01 DK112940 from the National Institutes of Health (NIH). ZS is supported by the Young Scientists Fund of the National Natural Science Foundation of China (81703214) and the China Postdoctoral Science Foundation (2016M602314). SNB is supported by a career development grant from the NIH (K01 DK107804). The funders had no role in the design and conduct of the study; collection, management, analysis, and interpretation of the data; preparation, review, or approval of the manuscript; or the decision to submit the manuscript for publication. Competing interests: All authors have completed the ICMJE uniform disclosure form at www.icmje.org/coi_disclosure.pdf (available on request from the corresponding author) and declare: no support from any organization for the submitted work other than those detailed above; no financial relationships with any organizations that might have an interest in the submitted work in the previous three years; no other relationships or activities that could appear to have influenced the submitted work. Ethical approval: The Institutional Review Boards of Brigham and Women’s Hospital and the Harvard T. H. Chan School of Public Health approved this study. Return of the mailed questionnaire was considered to imply informed consent. Protocol number: 2009-P-002375. Transparency declaration: The lead authors (the manuscript’s guarantors) affirm that the manuscript is an honest, accurate, and transparent account of the study being reported; that no important aspects of the study have been omitted; and that any discrepancies from the study as planned (and, if relevant, registered) have been explained. Data sharing: The statistical code and technical processes are available from the corresponding author at zshan@hsph.harvard.edu. Labor Force Statistics from the Current Population Survey. Work schedules (flexible and shift schedules). 2018. https://www.bls.gov/cps/lfcharacteristics.htm#schedules. National Institute for Occupational Safety and Health (NIOSH). NIOSH training for nurses on shift work and long work hours. 2015. https://www.cdc.gov/niosh/docs/2015-115/default.html.
. Long working hours, socioeconomic status, and the risk of incident type 2 diabetes: a meta-analysis of published and unpublished data from 222 120 individuals. Lancet Diabetes Endocrinol2015;3:27-34.